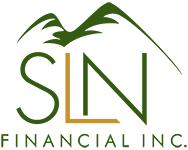 July 15, 2015 - Sticking To Your Financial Goals | SLN Financial, Inc.
Everyone has goals that they'd like to reach. Maybe it's running a marathon, writing a novel, retiring early, or taking control of your finances. Whatever your personal goals are, reaching them takes commitment and forward progress. One of the benefits of working with a professional on your financial goals is that we can help you define your goals and act as your mentor and accountability partner in achieving them. What would you like to accomplish? For most people, action toward a goal doesn't start until they've identified the goal and committed to an actual date. Rather than say, "I'd like to retire some day," say something like, "I'd like to retire at age 63 with $300,000 more in my retirement savings." Every goal requires intermediate steps and regular actions to achieve success. We help our clients break down their goals into annual (and often monthly) steps. Using the example above, we might add the intermediate steps of "contribute 15% of annual salary to 401(k)" and "put an extra $1,000 into short-term savings each month." We check in with our clients as often as they need to stay accountable to their goals. Reaching your financial goals takes a lot of willpower and commitment, and deviations from your goals are normal. If you have a tough time sticking to your action plans, you're not alone. Research into behavioral economics shows that many people struggle with forgoing short-term benefits (such as shopping and eating out) for long-term goals (like saving for retirement or a big family vacation)1. The trick is to get back on track quickly and not let a small bump derail the whole process. Curb impulse buys by unsubscribing from marketing lists, staying away from your favorite stores, and instituting a 24-hour cool-down period for any purchase over a set amount. Reward yourself for completing financial tasks or reaching intermediate goals. Involve your family members in discussions about which financial choices will benefit you the most in the long run. Will eating out daily give you the most pleasure, or would you rather put that money toward a long-term goal like a family vacation?